THANK You to everyone who made this year’s Thanksgiving Food Drive successful! We partnered with some wonderful agencies to identify 100 families that, because of you, will have a full Thanksgiving Dinner! Special thanks go out to Smith’s, General Mills, Christy Mae’s, Chick-fil-A for donating food. Also to The Event Palace, Civitans, MCH, Pegasus Legal Services for Children and Perfectly Imperfect. Most importantly, thanks to all our fantastic volunteers!! HUGE shoutout to ServyPro of Rio Rancho/Sandoval County for the donation of a truck to haul our supplies to the Backpack Assembly Party on Aug. 7th! Thank you so much for your support! Thank you to everyone who came out to help count supplies for this year’s project! We have an exciting opportunity to help out at McCall’s Pumpkin Patch in Moriarty and help raise money for our upcoming Thanksgiving Food Box project this year! On Oct 21 and 22nd from 10am to 6pm, Help Equals Hope will be general volunteers working as needed in various areas throughout the Pumpkin Patch. Fun loving volunteers can sign up now. We are limited to 20 volunteers per shift, so if you’d like to volunteer with friends, please sign up together as soon as you can. The more slots we have covered, the more money we’ll make so feel free to sign up for more than one shift if you’d like. Volunteers will check in at the main gate office 5 minutes before the start of their shift and will be assigned to tasks as needed by the Pumpkin Patch staff. This is a great way to have a fun time and to help raise money to feed New Mexico families at Thanksgiving! See you there! 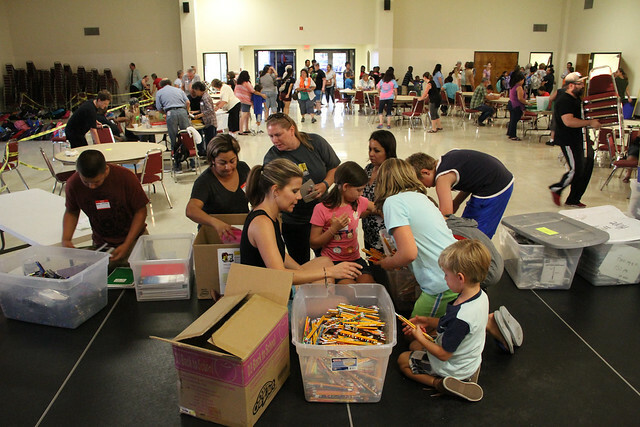 Thanks to all our fantastic sponsors, donors and the 180 amazing volunteers that came to the Assembly Party, we were able to distribute 1181 backpacks to students throughout New Mexico and the Navajo Nation just across the border in Arizona! Together Backpacks this year were donated to groups including Healthcare for the Homeless, Haven House Domestic Violence Shelter, BCSO, Grandparents Raising Grandchildren, schools in Cuba, Mountainair, Albuquerque, Rio Rancho, Pecos, and Jemez Valley. Special thanks to this year’s sponsors and those that donated school supplies, money or food to help make our project successful: Nativity of the Blessed Virgin Mary, Wild Pet Food Plus, Sandia Presbyterian Church, AutoCorrect, Chick-fil-A, Route 66 Civitans, and Meineke Car Care Center. Hope to you see you all on Monday 8/7 to help New Mexico kids! We need some volunteers from approximately 7:30-9:00pm to help clean up the parish hall as well as return supplies and equipment back to storage unit. If you can help, please do so our hardworking crew won’t have to stay as late this year.